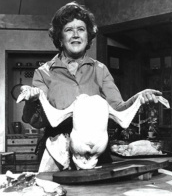 I used to sit in my grandmother’s kitchen and watch Julia Child (full disclosure-I love Julia Child) for hours. She was so real and funny. She knew how to make you feel that you could cook anything. Because of her, I used to think how cool it would be to be a chef. Obviously, I didn’t take that road, but I have never given up the dream of becoming a chef not just a cook (I know that isn’t going to happen, but I still dream about it). Now I spend my time in the kitchen at the computer trying to create recipes that taste good, look good and are good for you. But what good is a great recipe if you don’t know what the words mean? 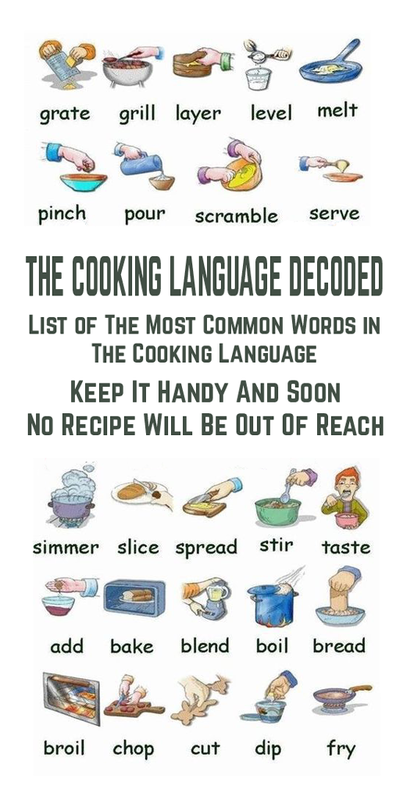 There is a whole other language that is spoken in the cooking world. Some words you can guess the meaning, but for others you need a food dictionary. So I thought it would be a good idea to put together a list of the most common words in the cooking language. Keep it handy and soon no recipe will be out of reach. Chop -To cut into bite-sized pieces with quick, heavy blows of the knife. Cube -To cut into little cubes that are usually ½ -1 inch. Dice -To cut into really tiny cubes that are anywhere from ¼’ to 1/8 of an inch. Grate -To take a large piece of something and make it smaller by rubbing against a coarse surface. Usually requires some type of grater. Julienne -To cut into long skinny strips that are 2 inches long and 1/16th of an inch wide. 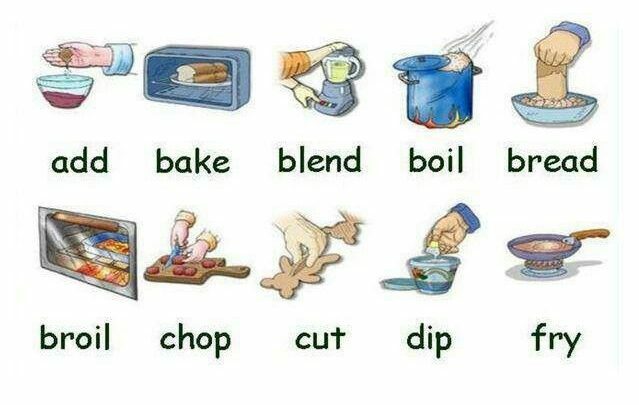 Mash -To make food soft by crushing, beating or squeezing with a fork or masher. Mince -To finely cut something as small as possible using a knife, grinder, blender or food processor. Pare -To cut off the outside covering of items such as potatoes and apples. Peel -To strip the outer covering of foods like oranges and grapefruits. Score -To make shallow or deep cuts in a decorative pattern with a point or knife. This allows food to cook more evenly. Shred -To cut into very fine strips or pieces. Slice -To cut into even slices, many times across the grain. Snip -To cut into small uniform lengths using kitchen shears. Bake -To cook in the oven. 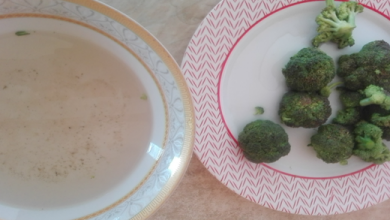 Blanch -To plunge food into boiling water for a few seconds (up to a minute or two) and then immediately place in cold water. 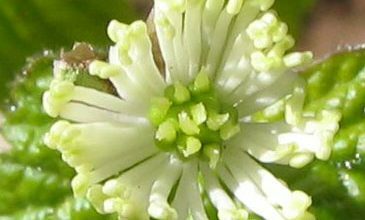 This is used to loosen skin, brighten color and enhance flavor. Braise -To cook in a small amount of liquid in order to concentrate flavor. Broil -To cook close to a direct heat source. This will cook your meat quickly and give a nice brown exterior. Grill -To cook above a heat source (gas, charcoal, wood) in the open air. Pan -fry-To cook larger pieces of food in a small amount of hot fat, turning only once or twice. Parboil -To cook partially in boiling water. Poach -To cook in a shallow pan of water that is just below boiling. Reduce -To cook liquids down so that some of the water evaporates. Roast -To cook, uncovered, in an oven with the goal to produce a well-browned exterior and moister cooked interior. No liquid should contact item being roasted. Sear -To cook quickly over a high heat so that juices are sealed inside. Can be done in very hot oven, under a broiler or in a skillet. Al dente -Usually used to describe how to cook pasta. It is when pasta is cooked for shorter period of time so it has a slight resistance when chewed. Fresh pasta can’t be cooked this way, as it is too soft to start with. Beat -To blend quickly in order to add as much air as possible so that the end result is smooth. Cream -To work a fat against the side of the bowl until smooth adding tiny air bubbles to the mix. Many times sugar is also included. Drizzle -To pour a liquid over a food in a thin stream. Fold -To incorporate a delicate substance, such as whipped cream or beaten egg whites, into another substance without releasing air bubbles. Cut down through mixture with spoon, whisk, or fork; go across bottom of bowl, up and over, close to surface. The process is repeated, while slowing rotating the bowl, until the ingredients are thoroughly blended. Resting -To allow a roasted meat or turkey to sit for 20-30 after removing from the oven before slicing. Loosely cover item with foil to maintain heat. Sift -To shake through a fine sieve to combine dry ingredients. 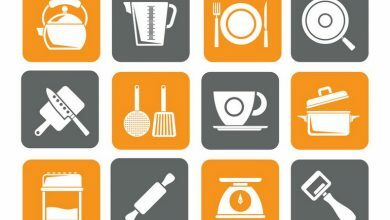 Now it’s time to start mastering the cooking language so head to your kitchen and get cooking. Bon Appetite! 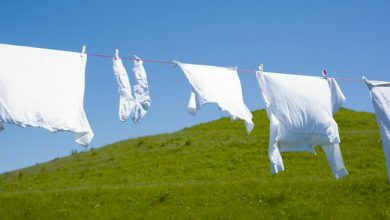 My Clothes Were Never Pure White and Fresh Smelling after Washing. Then my Neighbor Told me This Trick!